"Legend says that in mankind's darkest hour, a hero will rise...born of lightning"
Casshern debuted in Japan in 2002, the first feature of Kazuaki Kiriya, previously known as a photographer and the husband of J-pop star Hikaru Utada. Based loosely on the 1970s Tatsunoko anime Casshan, Kiriya's film came in for some fairly polarizing reviews, with many absolutely hating it, and still others adoring it. As a proud owner of the Japanese three-disc DVD set, I fall into the latter camp, though I understand the detractors. Still, I was excited to see it get picked up for U.S. distribution, as it's the kind of film that begs to be seen on a big screen. Due to corporate re-shufflings and the like, Casshern vanished without a trace, only now belatedly surfacing on DVD. The catch is that the disc presents Kiriya's director's cut, which actually shears about 24 minutes off the original run time. Whether this was legitimate re-thinking by Kiriya or a "cut the film or we'll cut it ourselves" ultimatum is unknown to me, but it does provide a reason for fans of the film to give the disc a look. Set in an alternate Earth of indeterminate year, a fifty year war between Asia and "Europa" has finally ended with Asia victorious, though in its aftermath, local rebellion has sprung up against the militaristic regime. Azuma (Akira Terao), a geneticist, tells the ruling body that he has discovered neo-cells, present in the earliest strain of humanity still existing. These cells, properly harnessed, can literally re-build the human body, making immortality within reach. Everything goes wrong however, and the harvested neo-cells regenerate into their former owners (dubbed Neo-Sapiens) after an inexplicable lightning phenomenon. Azuma uses the properties of the neo-cells to resurrect his dead son Tetsuya (Yusuke Iseya), who becomes enhanced by the neo-cells into a super-being. With the Neo-Sapien leader Burai (Toshiaki Karasawa) swearing to destroy humanity for what they've done, it's up to Tetsuya to save everyone. The first thing that will likely strike any viewer of Casshern is the eye-popping look Kiriya cooked up. Largely populated by digital backgrounds, the film features a succession of gorgeous visuals, sometimes overwhelming in their color and detail. The film blends futuristic designs with a steam-punk aesthetic for a timeless feel that I found appealing. And when you consider the film's paltry $6 million budget, you should be even more impressed. The look of the film serves the story well; the scenes in the nameless capital of Asia show a world of seething reds and oranges, coated in industrial bric-a-brac and a melange of Japanese and Russian text. The sky is choked off by clouds of pollution, and the sun hardly ever shines anywhere. The story is fairly grim, with Burai's crusade against humanity fully understandable, especially once we learn about his past. Tetsuya's role as Casshern, a legendary guardian of humanity, becomes a chance at redemption once we see his activities in the army, where his culpability in following orders results in atrocities that he must atone for. Despite the film's deeply cynical regard of humanity, the ending allows for some light to shine through, though it comes only at the price of death. As mentioned above, this release has been re-cut by Kiriya, and viewing some random sections of the original cut indicates that Kiriya did a lot of tightening up, trimming scenes down to their essentials. There is the other changes; the opening scenes of the fifty year war did not begin the original cut, and Kiriya chose to remove a closing monologue by Tetsuya, which I'm not sure I agree with. It does change the dynamic of the ending from one of optimism to a more pessimistic view, which tends the follow what comes before. Still, the movie does move along better, and things that weren't as clear to me in the original version made more sense, so he must have done something right. A further note on the two versions: the original cut looks to have translated more of the dialogue than the new cut, and there were a couple occasions where lines were completely different. 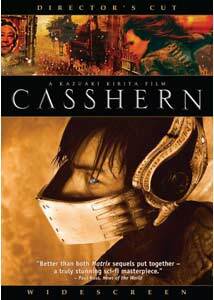 Casshern is a film that, had I seen it when I was 12 or 13, probably would have been my favorite film ever. As it is, it's too late for that, but I love it just the same, regardless of its weaknesses and eccentricities, or maybe because of them. It's a film made for a cult following, one I hope it develops over the years. And this DVD is as good a place as any for it to start. Image Transfer Review: Presented in its original scope ratio, Casshern looks quite good here, though the darker scenes have a higher level of grain to them than I would have imagined. Still, the vivid colors and detail look excellent, and make one salivate over an HD release. Audio Transfer Review: You have the option of a Japanese 5.1 or 2.0 track; the 5.1 track was quite fine, with decent directionality. The English subtitles are optional and clean. Extras Review: Trailers for Transformers and Next are it. The Japanese three-disc set for Casshern has four-plus hours of extras, including a 133 minute making of documentary; sadly, none of that was bothered with here. Not a surprise, but disappointing at any rate. Casshern finally sees stateside release in a barebones edition, but science fiction and anime fans should give it a look, if they haven't already picked up an import edition in the years since Dreamworks acquired it. Quality levels are acceptable, and the disc does contain a new cut of the film.